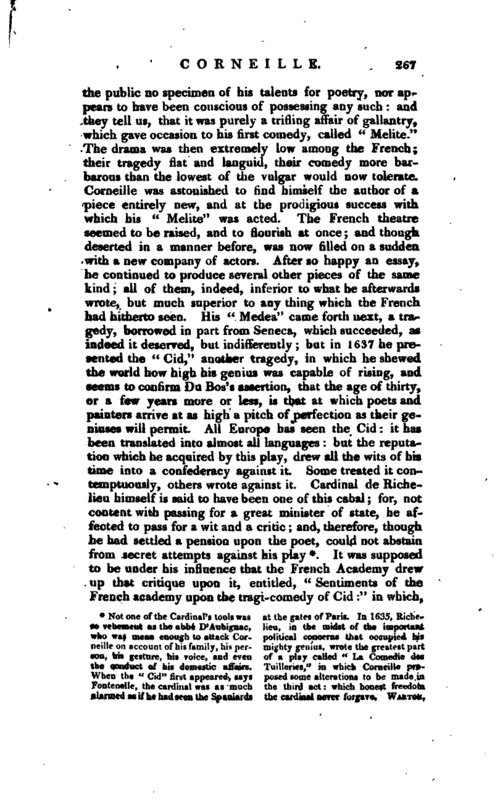 It was supposed to be under his influence that the French Academy drew up that critique upon it, entitled, “Sentiments of the French academy upon the tragi-comedy of Cid:” in which, | however, while they censured some parts, they did not scruple to praise it very highly in others. 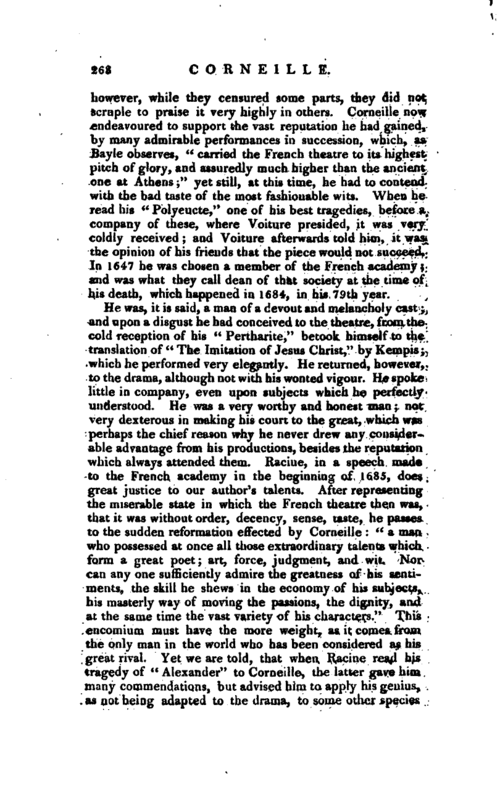 Corneille now endeavoured to support the vast reputation he had gained, by many admirable performances in succession, which, as Bayle observes, “carried the French theatre to its highest pitch of glory, and assuredly much higher than the ancient one at Athens;” yet still, at this time, he had to contend with the bad taste of the most fashionable wits. When he read his “Polyeucte,” one of his best tragedies, before a company of these, where Voiture presided, it was very coldly received; and Voiture afterwards told him, it was the opinion of his friends that the piece would not succeed. In 1647 he was chosen a member of the French academy; and was what they call dean of that society at the time of his death, which happened in 1684, in his 79th year. He was, it is said, a man of a devout and melancholy cast; and upon a disgust he had conceived to the theatre, from the cold reception of his “Pertharite,” betook himself to the translation of “The Imitation of Jesus Christ,” by Kempis; which he performed very elegantly. He returned, however, to the drama, although not with his wonted vigour. He spoke little in company, even upon subjects which he perfectly understood. He was a very worthy and honest man; not very dexterous in making his court to the great, which was perhaps the chief reason why he never drew any considerable advantage from his productions, besides the reputation which always attended them. Racine, in a speech made to the French academy in the beginning- of 1685, does great justice to our author’s talents. After representing the miserable state in which the French theatre then was, that it was without order, decency, sense, taste, he passes to the sudden reformation effected by Corneille: “a man who possessed at once all those extraordinary talents which form a great poet; art, force, judgment, and wit. Nor can any one sufficiently admire the greatness of his sentiments, the skill he shews in the economy of his subjects, his masterly way of moving the passions, the dignity, and at the same time the vast variety of his characters.” This encomium must have the more weight, as it comes from the only man in the world who has been considered as his great rival. Yet we are told, that when Racine read his tragedy of “Alexander” to Corneille, the latter gave him many commendations, but advised him to apply his genius, as not being adapted to the drama, to some other speuies | of poetry. Corneille, says Dr. Warton, one would hope, was incapable of a mean jealousy; and if he gave this advice, thought it really proper to be given. The French have ever been fond of opposing Corneille to Shakspeare ‘ 9 but the want of comic powers in Corneille, for his comedies are truly contemptible, must ever obstruct the comparison. His genius was unquestionably very rich, but seems more turned towards the epic than the tragic muse; and in. general he is magnificent and splendid, rather than tender and touching. He is, says Blair, an opinion in which all English critics agree, the most declamatory of all the French tragedians. He united the copiousness of Dryden with the fire of Lucan; and he resembles them also in their faults: in their extravagance and impetuosity. As to the opinions of the best modern French critics, on the merits of Corneille, we may refer to an admirable “Eloge,” published by Da Ponte, in London, 1808, and to Suard’s “Melange de Litterature,” 1808. 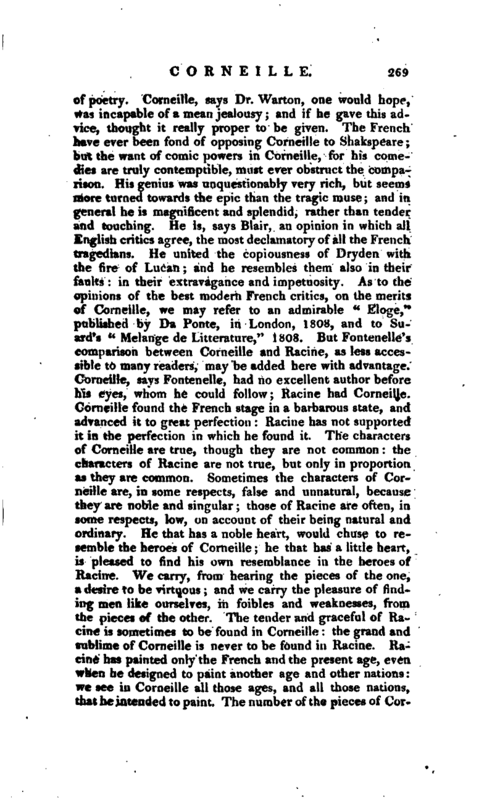 But Fontenelle’s comparison between Corneille and Racine, as less accessible to many readers, may be added here with advantage. 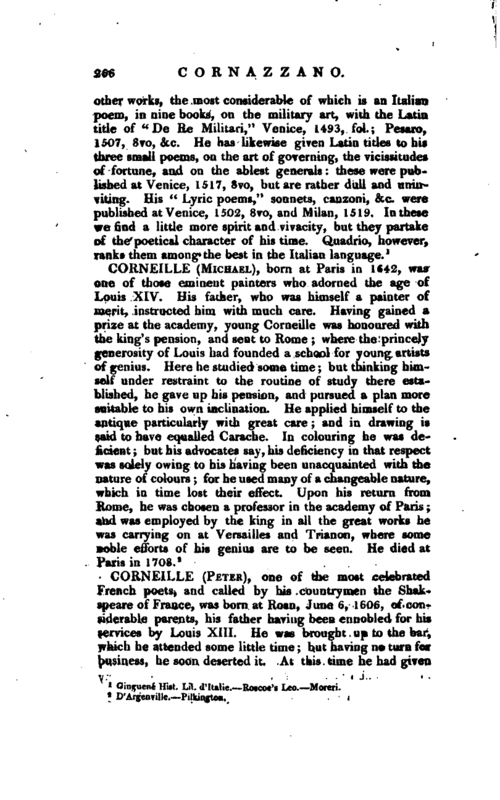 Corneille, says Fontenelle, had no excellent author before his eyes, whom he could follow; Racine had Corneille. Corneille found the French stage in a barbarous state, and advanced it to great perfection: Racine has not supported it in the perfection in which he found it. The characters of Corneille are true, though they are not common: the characters of Racine are not true, but only in proportion as they are common. Sometimes the characters of Corneille are, in some respects, false and unnatural, because they are noble and singular; those of Racine are often, in some respects, low, on account of their being natural and ordinary. He that has a noble heart, would chuse to resemble the heroes of Corneille; he that has a little heart, is pleased to find his own resemblance in the heroes of Racine. We carry, from hearing the pieces of the one, a desire to be virtuous; and we carry the pleasure of finding men like ourselves, in foibles and weaknesses, from the pieces of the other. The tender and graceful of Racine is sometimes to be found in Corneille: the grand and sublime of Corneille is never to be found in Racine. Racine has painted only the French and the present age, even when he designed to paint another age and other nations: we see in Corneille all those ages, and all those nations, that he intended to paint. The number of the pieces of | Corneille is much greater than that of Racine: CorneiHe, notwithstanding, has made fewer tautologies and repetitions than Racine has made. ID the passages where the versification of CorneiHe is good, it is more bold, more noble, and, at the same time, as pure and as finished as that of Racine: but it is not preserved in this degree of beauty: and that of Racine is always equally supported. Authors, inferior to Racine, have written successfully after him, in his own way: no author, not even Racine himself, dared to attempt, after CorneiHe, that kind of writing which was peculiar to him. 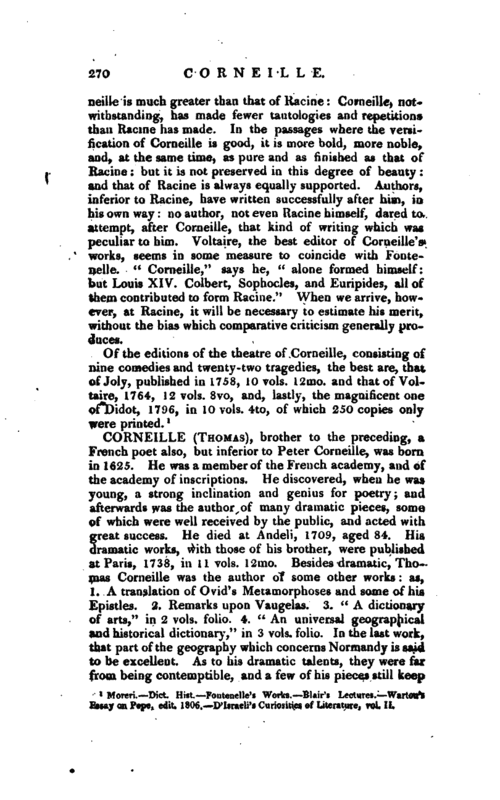 Voltaire, the best editor of Corneille’s works, seems in some measure to coincide with Fontenelle. “CorneiHe,” says he, “alone formed himself; but Louis XIV. Colbert, Sophocles, and Euripides, all of them contributed to form Racine.” When we arrive, however, at Racine, it will be necessary to estimate his merit, without the bias which comparative criticism generally produces. Moreri.—Dict. Hist. Fontenelle’s Works. Blair’s Lecture?. Warton’s Essay on Pope, edit. 1806. D’Israeli’s Curiosities of Literature, vol. II.